As a surgical nurse, Neeta Tvelil knew the amount of germs that linger on the bathroom floor, which is why whenever she’d see a towel one of her three boys had left on the floor wet, she would cringe. She knew there had to be a solution. With a few tweaks to a basic hand towel, she created the Tottels towel for tots. 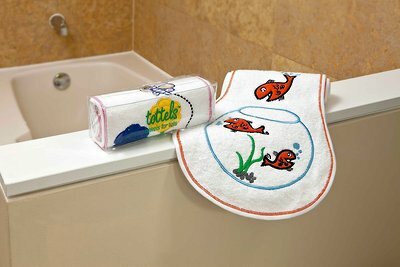 The Tottels towel has instantly solved the problem of wet towels lying in a bundle on the floor gathering germs and mold. The product promotes good hygiene and responsibility by making it easy to keep the towel attached to the rack and off the floor. Tottels are soft, fun, and come with adjustable snaps so they are always within reach of children of various heights. 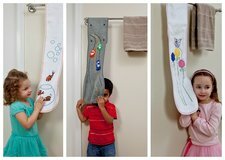 Tottels are currently available in three different patterns: Flutter, with flowers for girls; VroomVroom, with cars for boys; and gender-neutral SplishSplash, featuring fish. 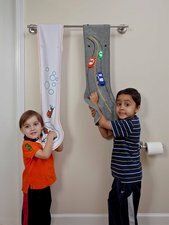 Tvelil’s boys played a part in the design process as they chose the colors and served as “design consultants.” Tvelil’s 6-year-old even requested that she move the cars up higher to provide more space to dry hands. Tottels towels are perfect for practical use and to promote good hygiene, but with the cute design and patterns they are perfect for basic home décor (try them in the kitchen or mud room too!). Tvelil says they’ve also seen a spike in sales with grandparents, who love to have something special for their grandchildren when they visit.